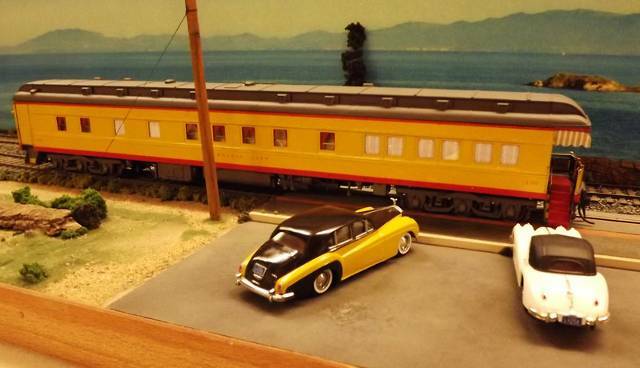 This model of the private car of L. Beebe and C. Clegg was rebuilt from a 'junk' Walthers observation kit built back in the early 1940s. 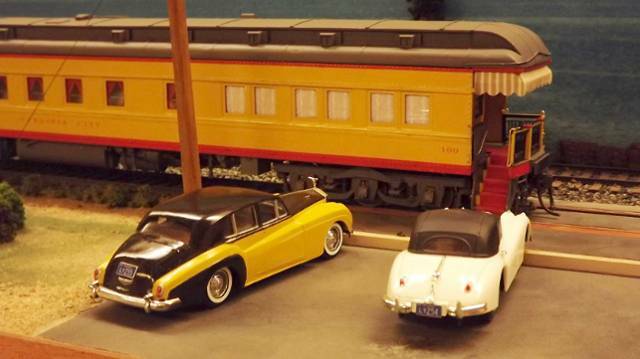 The setting is modeled after a photo of the prototype taken in 1955, along with their Rolls Royce Silver Cloud 'saloon' (British for sedan) and Jaguar XK-140 in their correct colors. 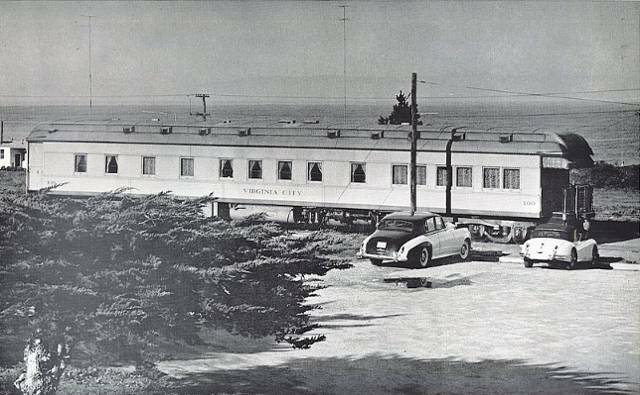 This photo of the "Virginia City" at Monterey CA in 1955 was the source for making a small diorama of that scene in which the model of that car is now displayed. It is capable of operating on any 2 rail O scale layout. Here is a wider view of the diorama in which the model of the Virginia City is set. The 1955 Rolls Silver Cloud is a Verem model from the late 1960s and features a sprung suspension. Originally all pink, it was disassembled, stripped, changed to left hand drive, re-detailed for US sized tags and repainted like the prototype in the B&W photo. The 1954 Jaguar XK-140 is much newer model. A Jag with the top up was only available in black. So this one was also disassembled, stripped and repainted to better represent the prototype.